The increasing exposure of much of the global population to disasters and hazards poses threats to lives and livelihoods, particularly to those who reside in impoverished areas of the planet. Whilst immediate concerns regarding the welfare of human beings are of the greatest importance, livestock are often a significant contributor to this welfare in the longer-term. Population growth, urban development and expansion along with an increase in demand for nutritious food of animal origin, raises concerns regarding the availability and use of natural resources. Animal products are important contributors to the food security and nutrition of the global population, particularly in most developing countries. By 2050, the demand for animal products is expected to be 60-70% higher than current levels. Meeting such a huge demand for animal products calls for concrete actions that address the low efficiency of livestock to convert feed into edible protein and to minimize the direct competition of livestock with humans for cereal grains. In addition, a significant challenge will be to resource the large amount of biomass needed as animal feed to produce the animal source foods in the future. Livestock use a large share of agricultural land (equivalent to 30% of the world’s ice-free surface) and are often considered a resource drain; at least 8% of global human water use is dedicated to the irrigation of feed crops. For many years, the high level of emissions of greenhouse gases from the livestock sector has been making headlines. Livestock account for approximately 14.5% of all anthropogenic greenhouse gas (GHG) emissions, 45% of which are attributed to production, processing and transport of feed. 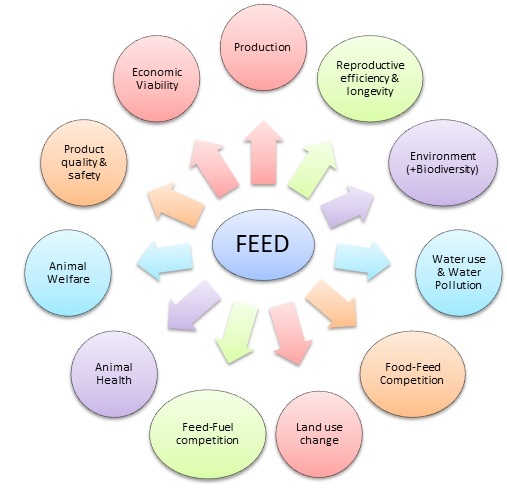 Furthermore, it is important to realize that animal feeding impacts almost all sectors and services of the livestock sector (Figure 1, Makkar, 2016a). Global population is expected to reach at least 9.6 billion people by 2050, with 70% of people living in cities. Animal products are expected to play an increasingly critical role in global food security and nutrition. Indeed today, livestock make a substantial contribution to the poor in developing countries, providing a vital source of protein, vitamins, minerals and income, as well as transport and manure. The impacts of livestock contribution to food security are more evident in areas, which are not suited to crop production, such as marginal areas. It is therefore clear that strategies must be put in place to ensure that the sector becomes as efficient and sustainable as possible. In 2016, the deyr/hagaya (October to December) rains failed in much of southern and southeastern Ethiopia. In most affected areas, the cumulative rainfall during this season were less than 25 percent of the average. This was followed by below-average, late and erratic 2017 gu/genna (March to May) rains, which exacerbated the drought conditions in southern and southeastern Ethiopia. This situation was further compounded by the below-average and scattered 2017 deyr/hagaya rains across the region. In the drought-affected areas, livelihoods are based on pastoralism and households are almost entirely dependent on livestock for their food and income. Extremely limited pasture and water has led to poor body conditions, emaciation and weakened immune systems among livestock, resulting in very low milk production and marked reduction in the reproduction rate (Figures 2 and 3). Livestock-based livelihoods are therefore heavily impacted by the ongoing drought. Terms of trade have undergone through substantial changes with livestock owners receiving just one quarter of the regular price for the sale of sheep and goats. Drought-affected pastoral households face reduced milk production and limited income generation, a situation that has led to increased malnutrition levels and constrained food access. Therefore, responses to emergency situations in contexts such as these need to include components which address the fate of livestock populations, such as the provision of supplementary animal feed. Supplementary feeding can take a number of forms depending on the type of livestock involved and the nature of the situation (FAO, 2016). Essentially though, it involves the provision of extra feed to livestock owners to enable them to meet the nutritional needs of their livestock. Livestock feeding strategies during and after a disaster can present livestock owners and producers with a host of challenges, particularly in the developing world. In countries across the Horn of Africa, including Ethiopia, the lack of feed inflicts major adverse effects on livestock during times of drought. This has been identified as a major problem by development agencies, NGOs, researchers and extension workers alike, and one which must be addressed urgently. Unavailability of feed in Ethiopia is primarily due to an inefficient feed sector, low levels of infrastructure, competition for the feed between livestock in the highlands and pastoral areas, and the reduced availability of rangelands for pasture due to an increase in human population, and as a result, conversion of pasture lands to croplands. During the last decade, the Food and Agriculture Organization of the United Nations (FAO) has developed a concept of sustainable animal diets, which integrates the importance of efficient use of natural resources, protection of the environment, socio-cultural benefits along with ethical considerations (Makkar and Ankers, 2014). It has also promoted a number of feed and feeding strategies to address the feed shortages (Makkar, 2016b). For further information on these blocks, readers are referred to FAO (2007). Additional information about the above technologies and feeding strategies can be obtained from FAO (2011, 2012, 2017). Tables 1 and 2 provide information on the results that emanated from the workshop. In order to assess the feasibility of each proposed feed technology, and explore and consolidate thoughts of practical significance to Ethiopia, the participants were divided into two groups based on commonalities of the regions in terms of nature of crop production, biomass availability and other agro-ecological traits (see Figure 4, where groups are identified by the yellow and red boxes). Droughts frequently occur in the lowlands of these six regions, hence the interventions and the discussions focused on them. A major portion of Afar, Oromia and Somali Regions is lowland, while in Tigray, Amhara, Oromia, and Southern Nations, Nationalities, and Peoples' Region (SNNP) due to the different agro-climatic conditions and different livelihoods zones, a number of production systems, namely pastoral, agro-pastoral and cropping exist. These considerations influenced the prioritization of technologies and identification of their relevance. The technologies and feeding strategies were categorized as either High, Medium and Low priority. For the prioritization of the techniques a number of criteria were considered. These included availability of materials, food/feed competition, competition with current alternative livelihoods (other crop production versus feed/forage cultivation), knowledge of the local community regarding technologies and techniques, and current government initiatives which may enable the implementation of certain technologies. Figure 4. Regions in Ethiopia, and their two groups (Group 1, marked with a yellow rectangle and Group 2, marked with a red rectangle) which were considered in the discussion. UMMB containing anti-parasitic agent (pineapple leaves) Afar: Applicable due to availability of ingredients, not a complex technology, will add value to the leaves. 1 Further information can be obtained from Bakshi et al. (2017). Based on global experience, a number of feed and feed technology options are available to deal with emergency feed shortages. Of these options, the use of feed technologies that reduce roughage feed bulk and improve the nutrient availability are highly relevant. The introduction and popularization of the sturdy feed processing machineries such as hydraulic presses, bailers and pellet making machines could address the huge logistical and cost associated challenges that are encountered while transporting bulky fibrous feeds to the areas frequently affected by drought. There is a need to explore the source (suppliers), price and availability of various mechanical devices (e.g. hydraulic press, straw harvesters, bailers, forage choppers, mixers, among others). Most of these devices are not manufactured in Ethiopia or other countries in the Horn of Africa. Policies and incentives that encourage manufacturing of these devices within the country will help to prevent livestock mortality in pastoralist areas. In the southern, southwestern and western midlands of the country, due to the prevalence of tsetse fly (trypanosomiasis), and as a result of the low number of livestock, huge forage biomass from the grasslands is left underutilized. It was suggested that FAO should take a lead in devising the strategy and mechanisms to make use of this huge feed resource to bridge the feed deficit in pastoral areas during drought time. For such areas, an immediate practical application is the introduction of densifying machineries and popularization of their use among the private entrepreneurs or youth groups as well building the technical capacity on feed processing. In areas that are affected by recurrent drought, it is vital to establish feed and fodder banks, which would make feed and fodder available in the affected areas within the shortest time possible. The banks would be useful even during normal periods, as there is a shortage of biomass in the areas affected by droughts. Preparation of densified straw-based complete feed ration or compacted hay as bails could be prepared in seasons of biomass availability, and transported to the fodder banks. This will substantially reduce the logistical cost of transporting loose or uncompacted fodder, which is generally very high - a challenge faced by most development agencies. In addition, the fodder banks by improving and stabilizing the availability of animal feed and fodder, would also help reducing the volatility of feed costs, especially during drought times. In fact, the sudden high demand of feed caused by the relief interventions of development agencies causes an escalation in prices of feed even in regions unaffected by droughts. As a result of these observations it was suggested to explore the possibility of using unused storage places, if any organizations such as World Food Program (WFP) or other development agencies had these available, for the establishment of fodder banks. Caution needs to be exercised to ensure that animal feed and emergency food is stored separately to avoid their mixing. Certainly, a mechanism needs to be considered in recovering the cost of the feed/fodder stored in the fodder banks in normal years. One of the options could be supply of the stored feed/fodder to traders that provide feed to animals kept in the quarantine areas before exporting them. The fodder produced through spate and/or spread irrigation in the zones affected by drought could also be converted to hay, then bailed and stored in the fodder banks. The same could be applied to the fodder produced in the tsetse fly affected areas; alternatively this could be converted to complete feed blocks/pellets and then stored. Another technology, which is highly relevant for the drought-affected areas is the UMMB, which could also be stored well in advance, for example during November-January (before generally the drought strikes) and distributed as supplementary feed. It should be noted that the feeding of UMMB demands availability of some low-quality roughages and should not be fed alone. The costs of supplementary feeding in the form of UMMB, concentrate feed or urea-ammoniated straw can be decreased by feeding these supplements twice or three times a week, rather than feeding daily. This will sustain the animals, which is the prime objective during emergencies. A long-term strategy is required to plant and propagate thornless (spineless) cactus, which is rich in carbohydrates and water. Cactus has a low water footprint and can yield a high biomass in harsh conditions. Development agencies should consider giving attention to this plant because it provides opportunities to build a business around its multiple uses. The International Center for Agricultural Research in the Dry Areas (ICARDA) boasts extensive expertise on this plant and their presence in the region can be highly useful. In the lowlands of the regions considered here, at times of severe drought, only browses are available. These feed resources could constitute the bulk of feed available to livestock. Unfortunately, these feed resources are rich in polyphenolics (tannins), anti-nutritional factors that limit nutrient availability and decrease nutrient utilization in animals. For such areas, it is vital to pilot the production and use of blocks containing PEG and study their economic and social impacts. This technology helped to save thousands of animals in Zimbabwe during droughts in 1990s. The blocks containing PEG could also be stored in feed/fodder banks. There is some evidence that copper deficiency occurs in the Rift Valley region which may lead to reproductive problems and the loss of productivity in large ruminants. This may require the addition of this mineral to the feed. The UMMB could also act as a vehicle for feeding deficient minerals to animals; and the same could be done for strategic introduction of anthelmintics in the form of fenbanzadole or pineapple leaves. In UMMB production, availability and cost of urea are the major constraints. The poultry litter, where available in sufficient quantity, could be a potential substitute for urea. The poultry industry is developing in Ethiopia, and it is expected to continue to grow rapidly. The inclusion of poultry litter in molasses-based blocks or as a supplement in other low-protein feed sources (e.g. cactus), therefore, would help reduce feed costs and address the scarcity and high cost of urea. Other simple technologies such as use of appropriate feeding troughs and chopping of fodder are also relevant. These would help producing ‘more from less’ by reducing wastage of feed and increasing nutrient utilization. Backyard forage production using fodder trees could also contribute to shortage of conventional feed that generally occurs during times of drought. A number of technologies are available which could address the emergency situations and prevent livestock mortality. However, technologies alone are not sufficient. Equally important are the institutional support and policy options, which are integral for large-scale application of technologies and generating a high impact. A strong political will and leadership to drive the application of this holistic approach of amalgamating technical aspects, institutional building and policies will go a long way in addressing issues that affect pastoralists during emergency periods. We are thankful to all the participants of the workshop for providing input, which led to the development of this article. FAO provided financial assistance for organising the workshop, which is also gratefully acknowledged. We also thank Kara Jenkinson for her assistance in editing this article. USAID, 2010. The Livelihoods Atlas for Ethiopia. The Livelihoods Integration Unit. A joint Government of Ethiopia and USAID Ethiopia Document, 2010.